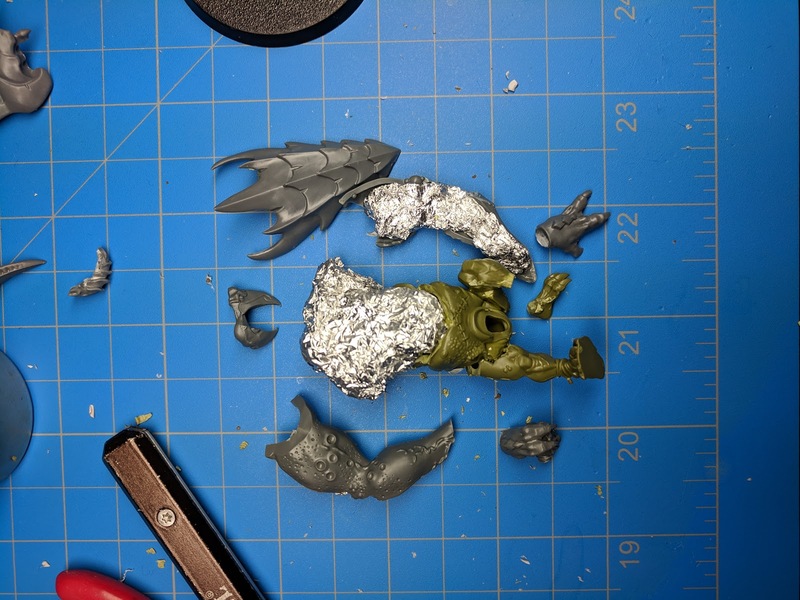 After making a good start on the first week of the Kitbashember project, real life happened. 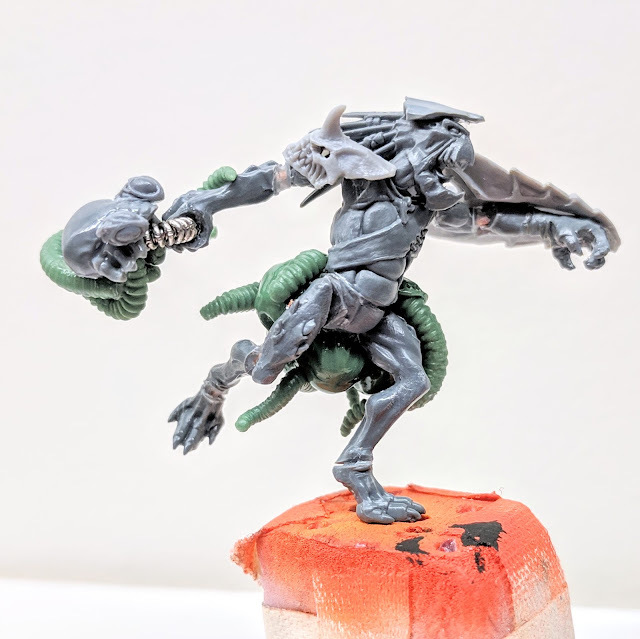 As a result, I got off my nice tempo, but I still endeavoured to crank out as many Kroot Tyranid Hunters as I could and to keep up my rhythm. 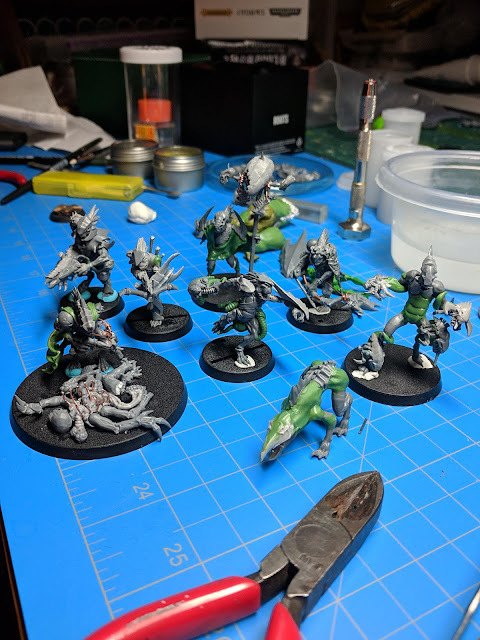 In the end, I cranked out 7 Kroot in total, which I'm happy with, but it still grinds my gears that I didn't make the full 10. You can see that he's sporting a genestealer skull on his right shoulder, which, in the hierarchy of my killteam, means he's one of the top dogs. 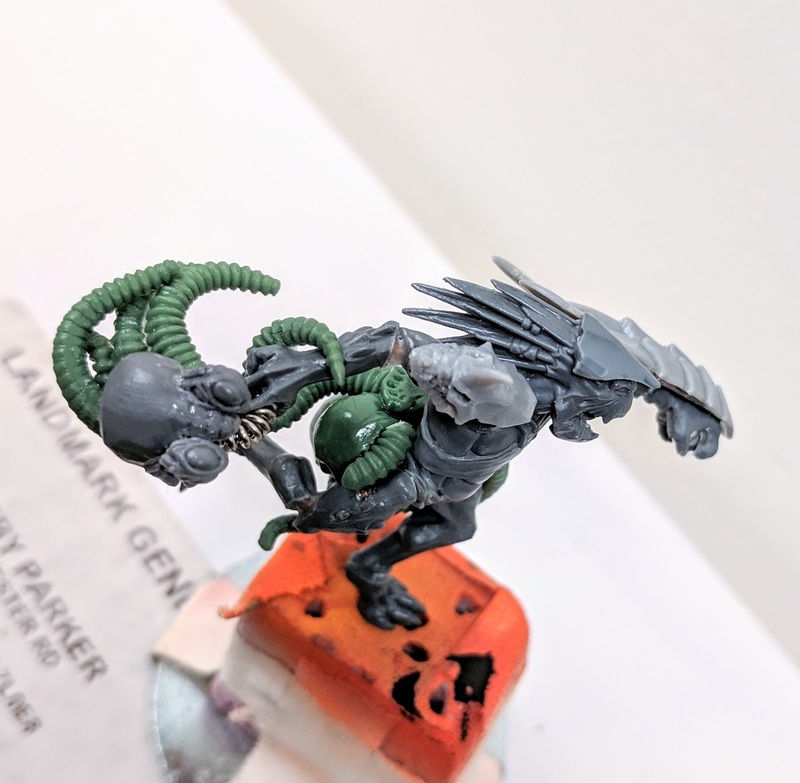 I feel like this seniority comes from his skill at pulling apart Tyranids and finding the best parts. You can see that he's got all manner of implements and vials to help him in the harvest. 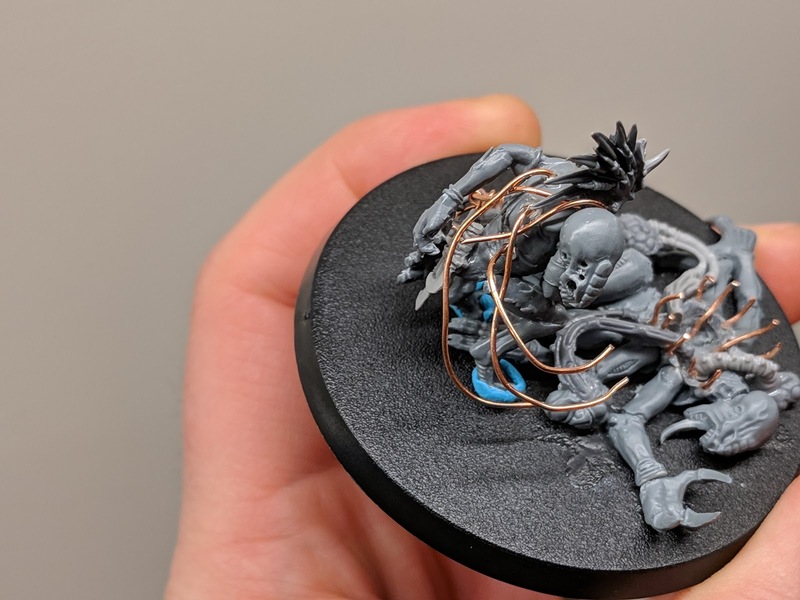 Though it pained me to do that to such a beautiful genestealer (who am I kidding. 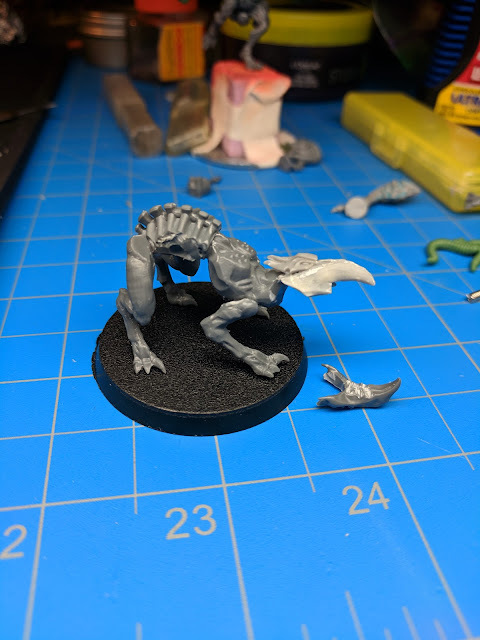 I've got a million of them), I am EXTREMELY happy with how he came out. 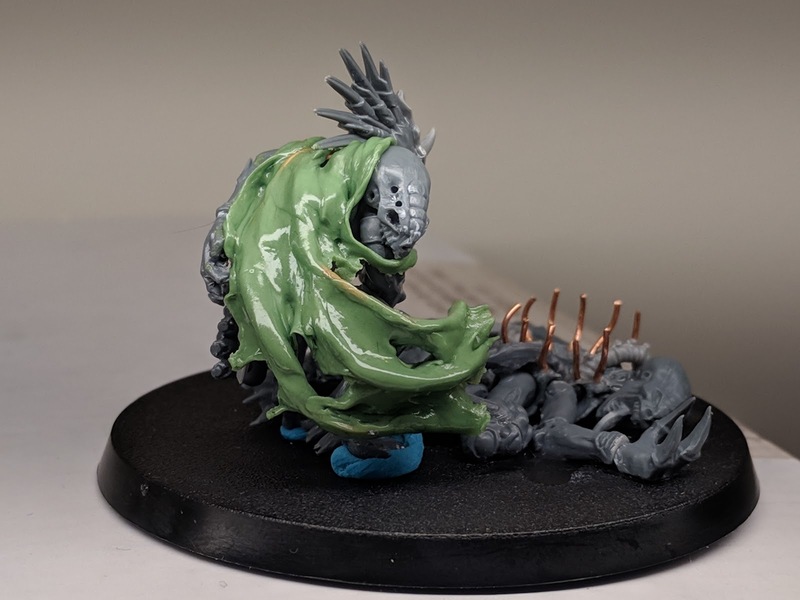 I still need to greenstuff him up, and this is mostly a model sketch, but I feel like he's in a pretty good state right now. He certainly was a HUGE it over on my Instagram. 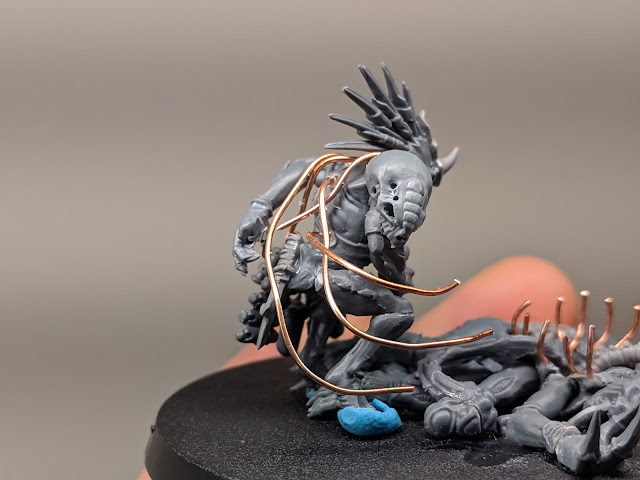 The medic's cloak also seemed to be a big hit, so here's a look at the wire armature I built underneath it. 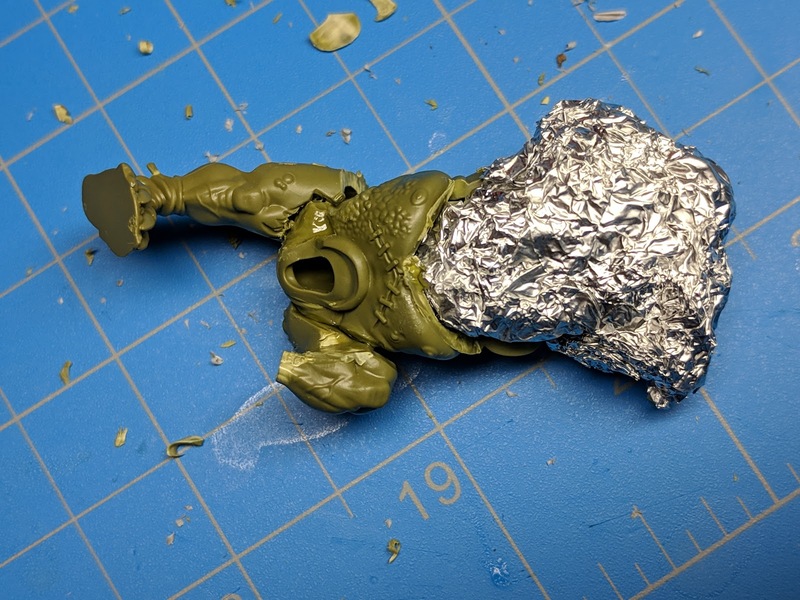 Once the armature was built, I stretched the greenstuff into a thin sheet and mostly just draped it over the armature. 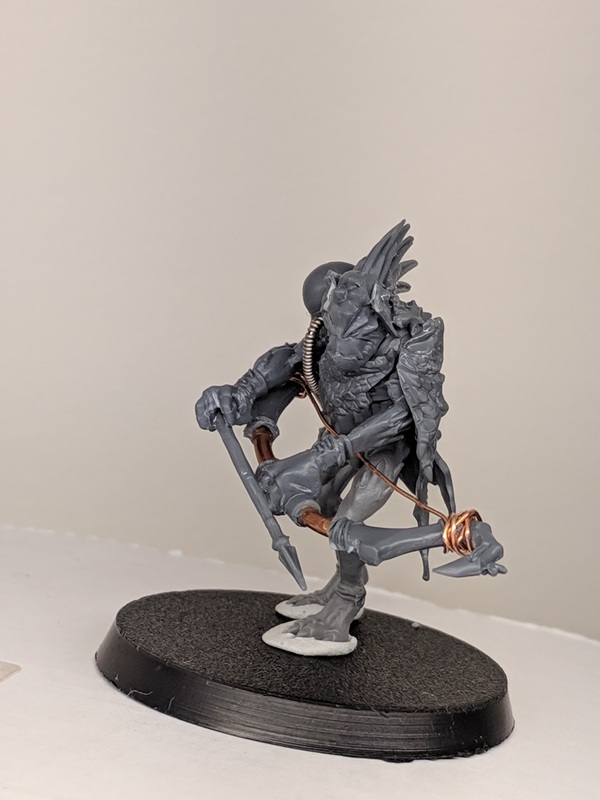 Next up was my grenadier! 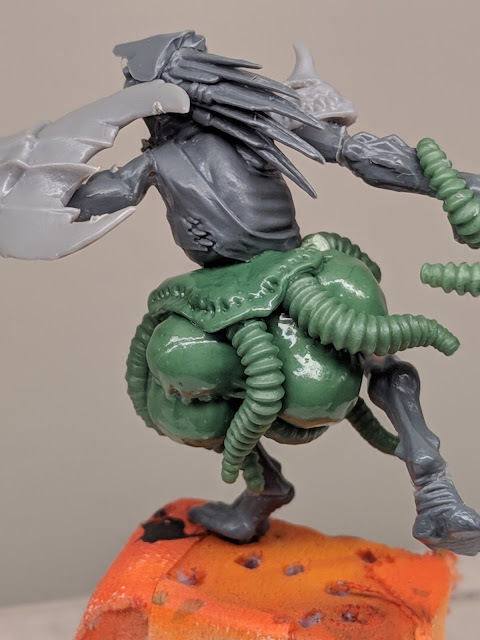 And what better Tyranid organism for a Kroot Tyranid hunter to chuck like a grenade than a SPORE MINE? You'll notice that this dude has got only a lowly ripper skull on his shoulder. That's because, when dealing with such volatile Tyranid organisms, Tyranid hunter grenadiers can have a very low life expectancy. 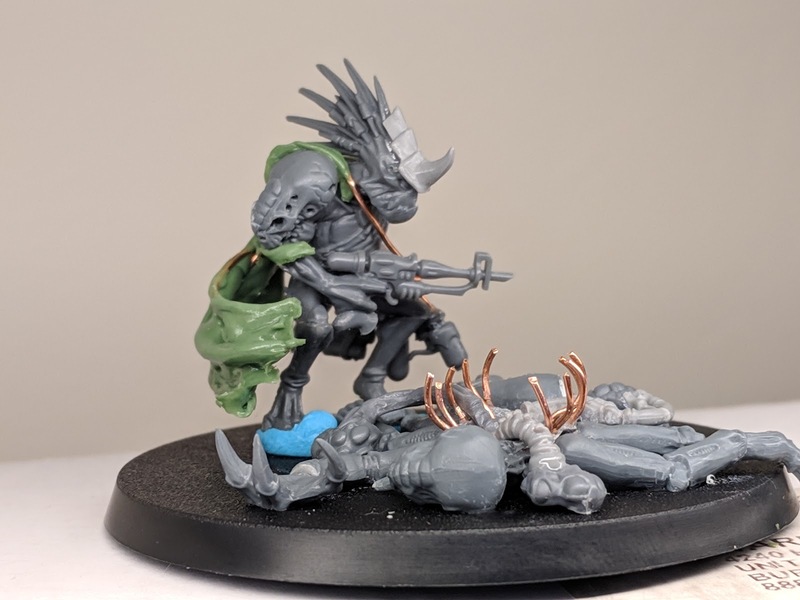 Therefore, they give the job to the newest, most inexperienced killteam members as a kind of trial by fire to see if they'll survive! 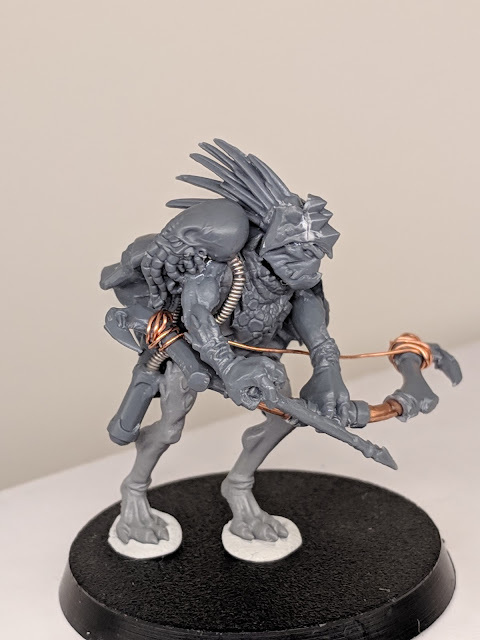 For my Psycho, I wanted to pursue the pretty crazy idea of a kroot who straps living rippers to his hands and feet, striding into battle and using them as weapons. 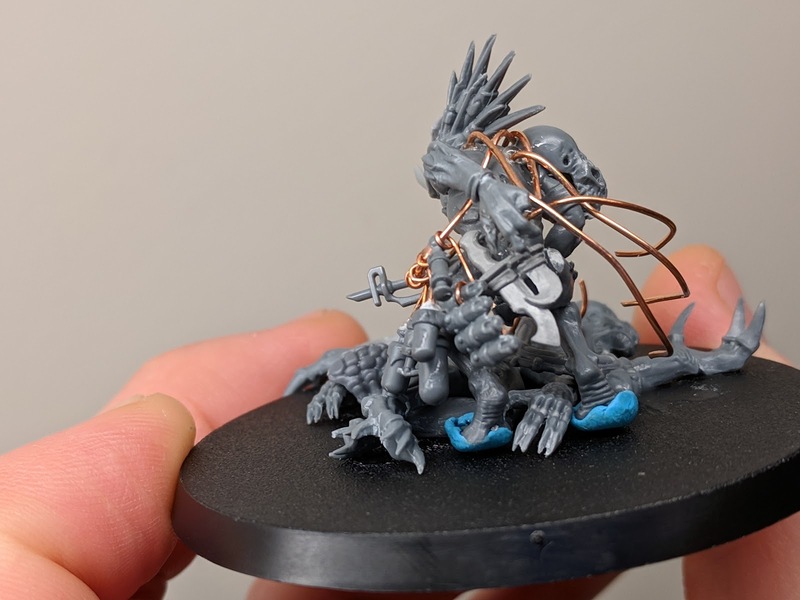 In my initial concept, I envisioned the rippers as unwilling subjects, forcefully lashed to the kroot's extremities. 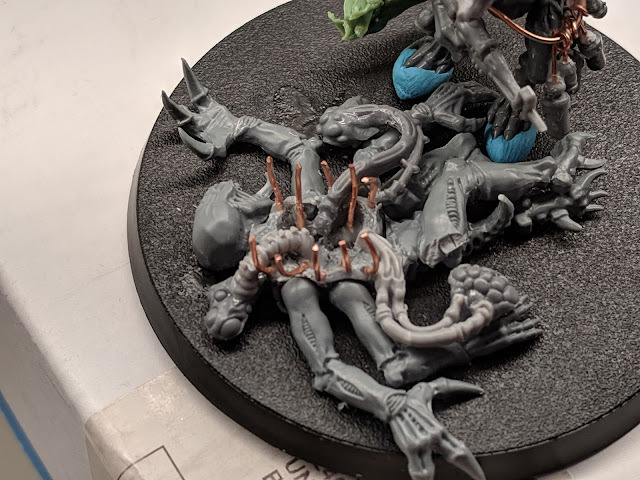 However, as I started to put the model together, and to sculpt the ripper tails winding around him, I felt like he'd be more interesting if he's somehow managed to develop a symbiotic relationship with the rippers in question. My idea for the background explaining why he'd been so successful at charming the rippers is that he started developing his abilities shortly after he killed and ate the ripper he wears around on his head. 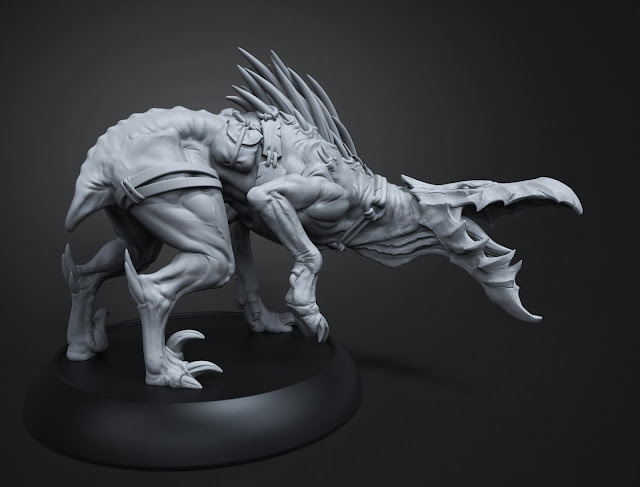 It's been hypothesized that he ate a ripper that served as some kind of hive node for the larger swarm, and he took on those abilities. 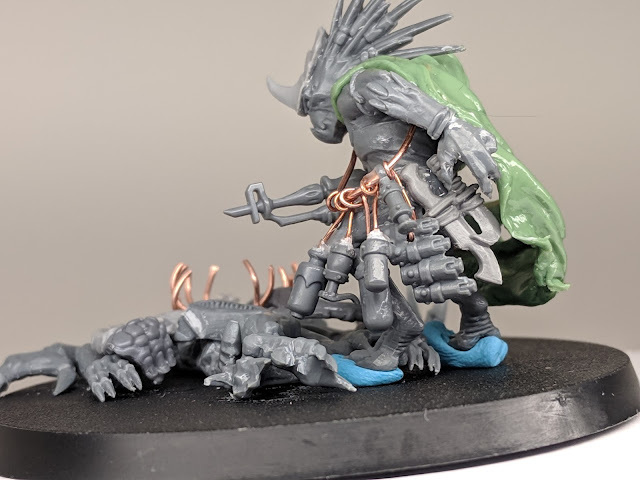 There are some in the hunting cadre who even wonder if his meal had a greater affect on him: causing him to start to see himself as one with the rippers! 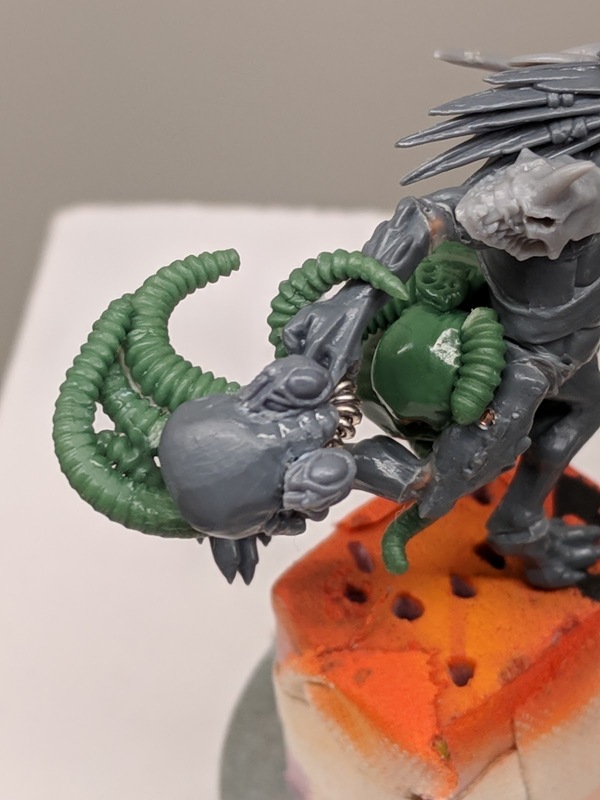 You can see the return of the Tyranid flesh hook bit as a Tyranid spine/barb that the kroot are using as arrows. 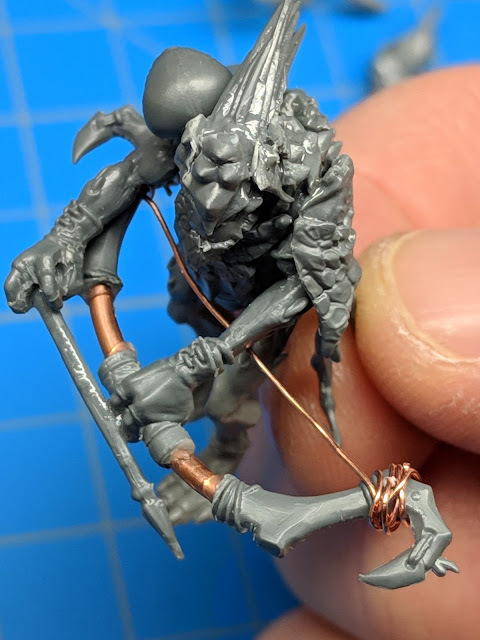 You can also see my favourite hobby bit to use on these kroot: super thin copper wire bindings! For my sniper/marksman, I wanted him to be an extremely sneaky git. But how could a kroot, which is already a master of fieldcraft and camouflage, get even sneakier? 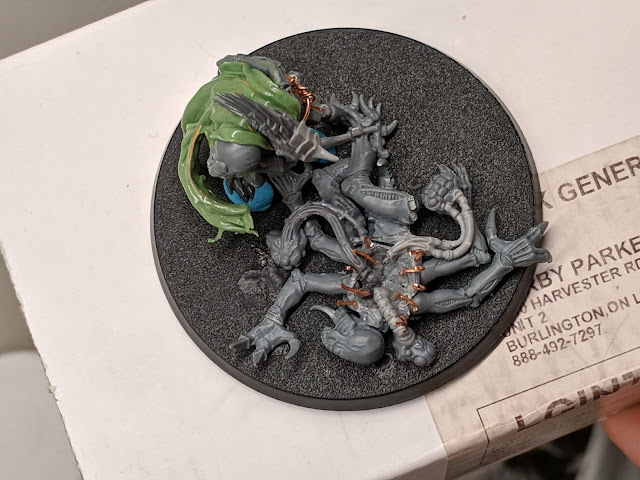 By growing a set of state-of-the-art Tyranid chameleonic scales, of course! However, that's a bit of a tall order for someone as impatient and feral as a kroot, so he just took the short cut: skinning a young Lictor alive and conspiring with a Haemonculus ally from the fighting pits to devise a way to keep the poor creature's disembodied head alive and attached to the scales! 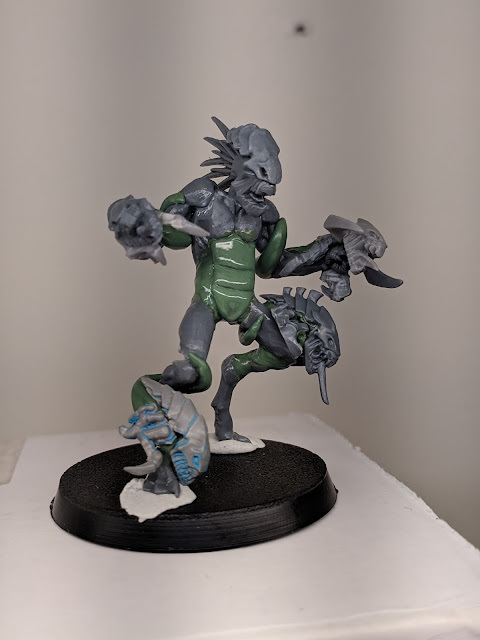 Their devious fellows, these Kroot Tyranid Hunters! 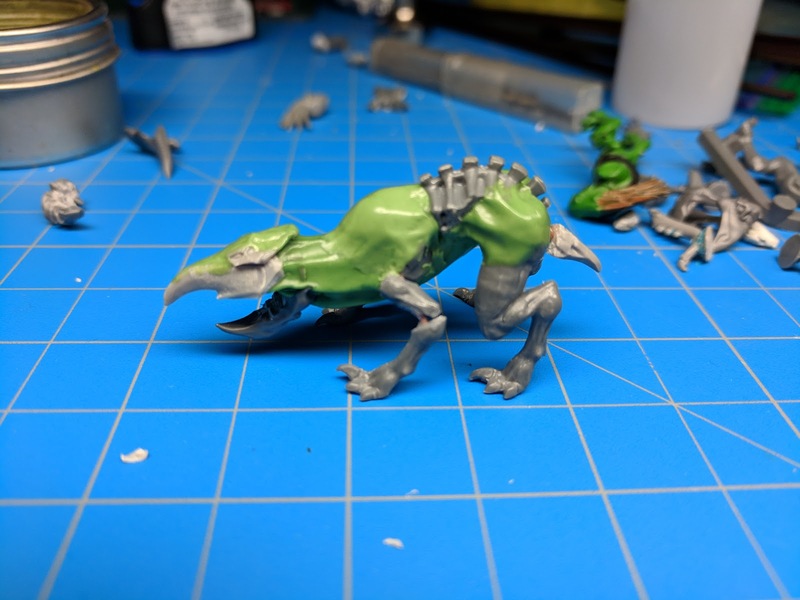 Though all the models I've already shown are still very WIP and require more greenstuffing, etc, before they are complete and ready for paint, the two further models I'll share are much more WIP. 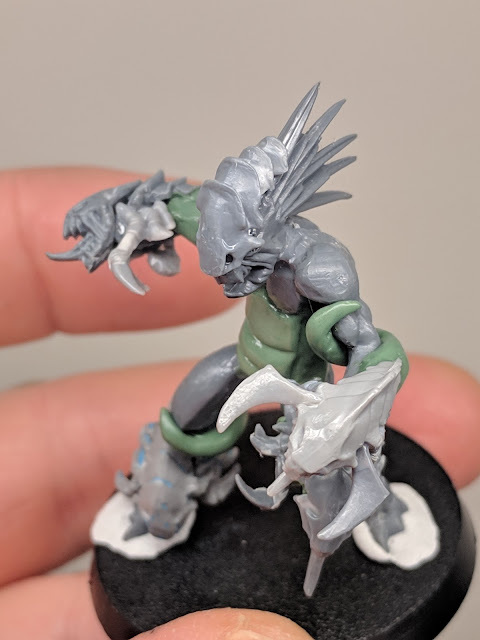 However, I did the work on them in Kitbashember, so I feel like they count. 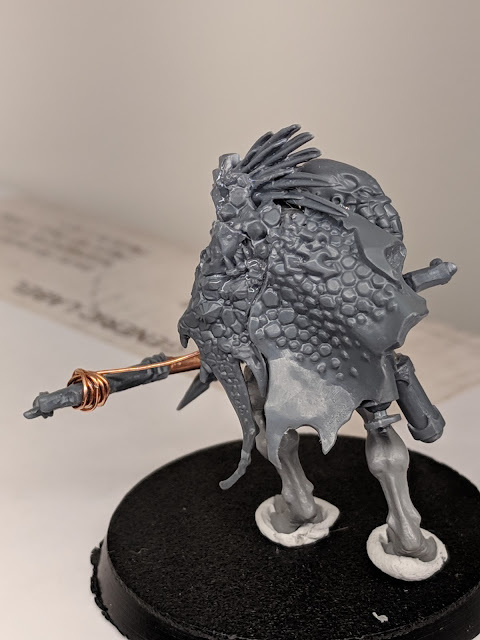 Taking pages out of the books of Brother Hydra and Bocks and Weirdingsway, I recombined pieces in different orientations to cobble together that loose shape. The legs are obviously from Bloodletter, which is a kit that might as well have sponsored my Kroot Tyranid Hunters for how much I use them as bigger Kroot. The front half of the body is also a Bloodletter torso, angled back with the head attaching to the bloodletter's pelvis. The other, rear part of the body is a genestealer torso that has been flipped backwards. The head was more of an adventure. The lower mandible/beak is from Ogroid Thaumaturge's staff. 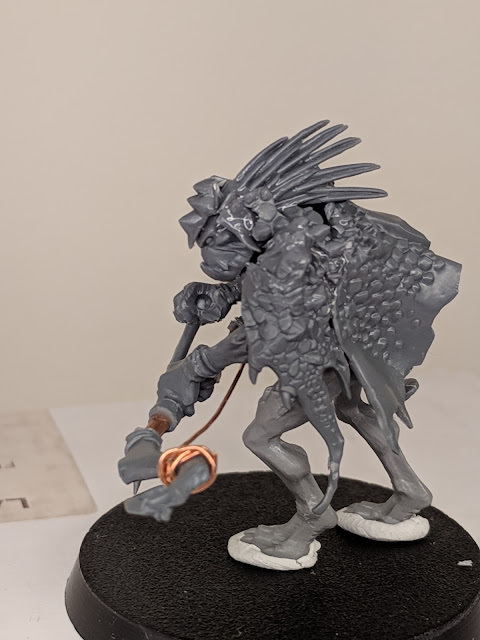 (no idea how to spell that: the big evil dude from Silver Tower). 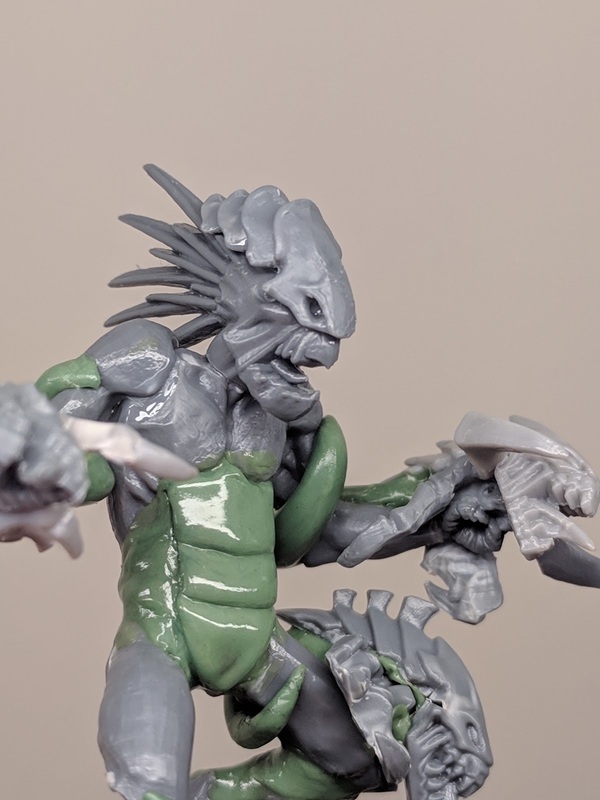 The upper mandible, however, is made from the two barbs at the end of the Tyranid Warrior head crest that is kind of reminiscent of earwig pincers. 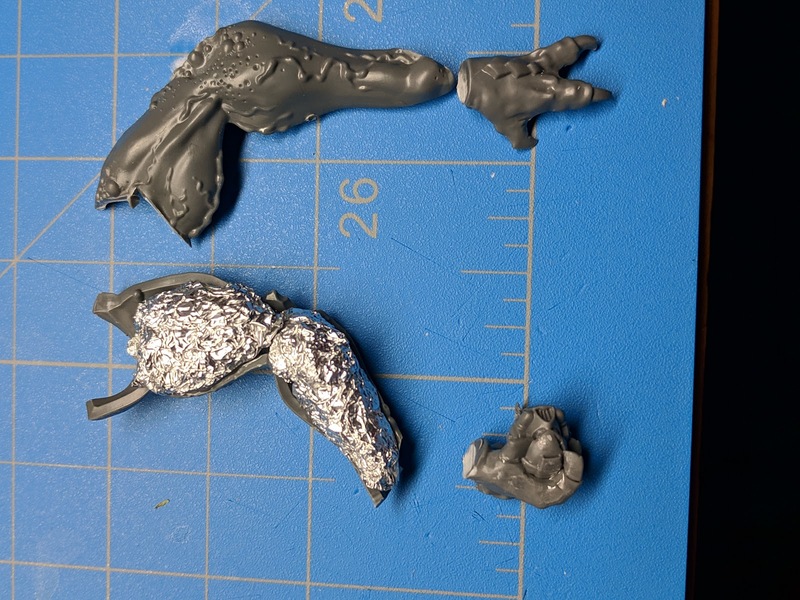 I cut them off then cut them down and glued them together in the rough shape of a beak. The eyes were stolen from a ripper. 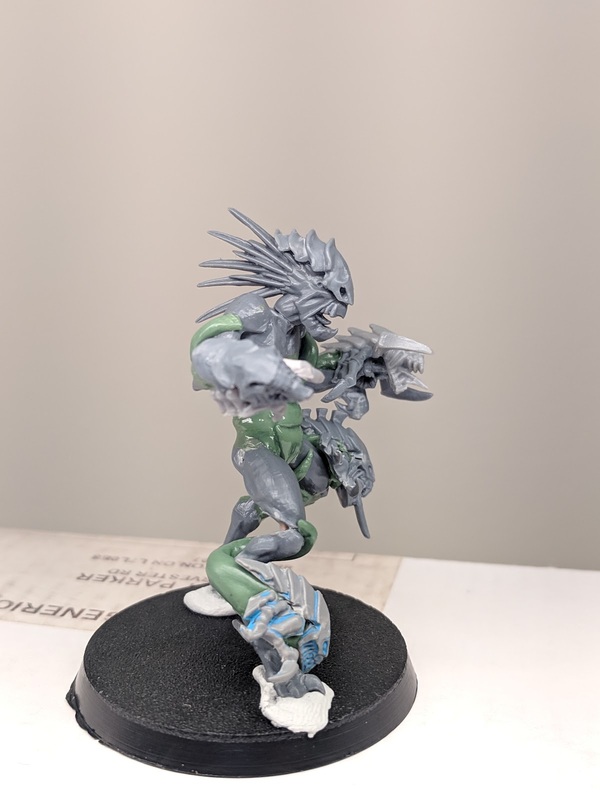 That's as far as I've gotten with the Kroot hound, so you can see there's still a bunch to do on him. 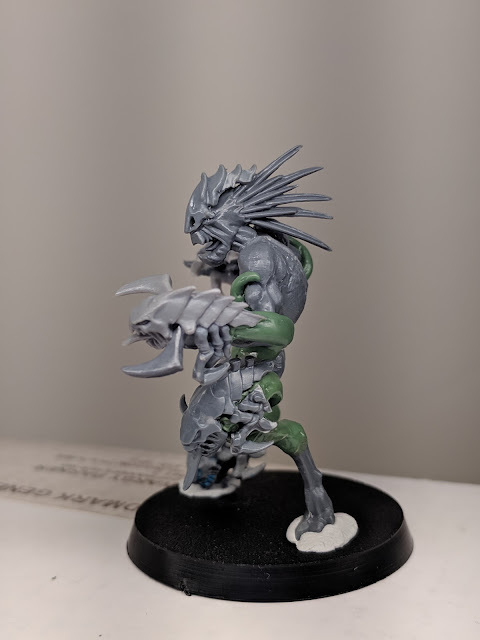 However, I'm pretty happy with how he's come along so far. The other scratchbuild/severe kitbash that I made the most preliminary of starts on was my entry for Brawler, which I thought would be best represented by a Krootox. I warn you, though: I've accomplished very little, so this might be a disappointing tease! And with other nurgle contributions from the Maggoth Lord, and some Tyranid hands to round it out. 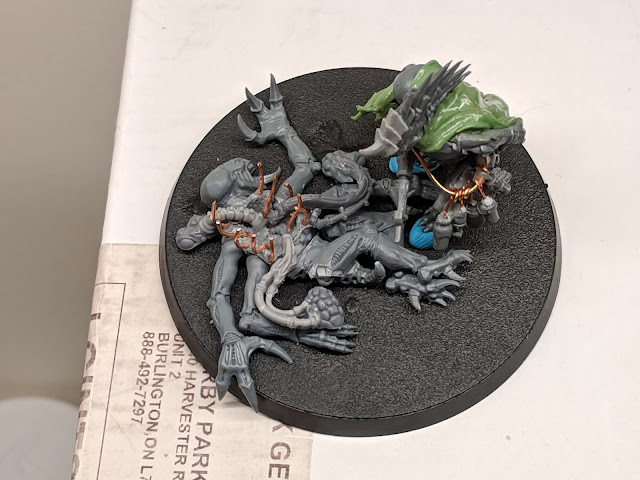 I swear that I do VERY MUCH want to finish all of these boys (heck, I even feel motivated to PAINT them...can you imagine? 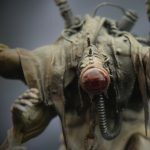 ), but I also know that I've feeling a bit of burn out on their project at present, so it will be some time before I get back around to them. Great stuff! Very interested to see how this squad progresses, especially that poor surgery victim on the medic's base. Oh, I assure you that the only "progress" the victim is going to see will come in the form of decomposition! He's less a surgery subject, and more of a harvestable crop from the perspective of the Kroot! 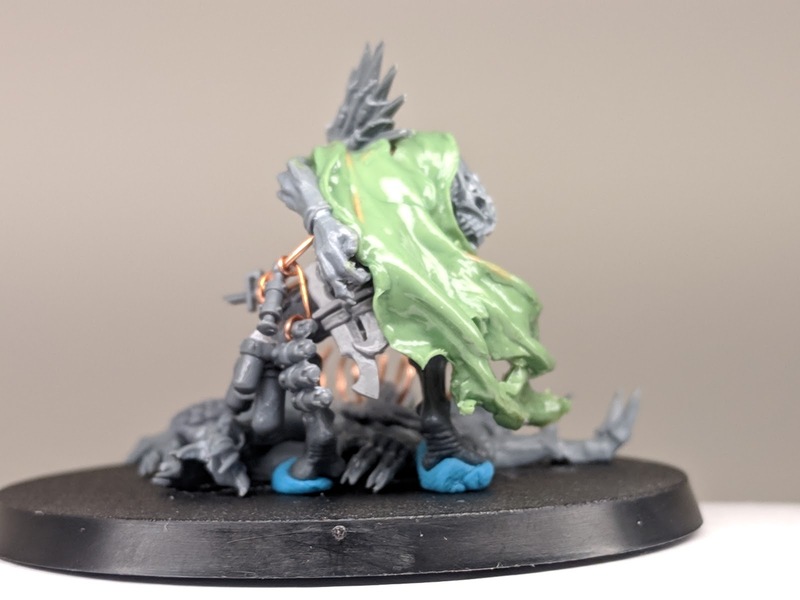 But, yes, I need to greenstuff in the gaps, particularly around his opened ribcage. I'm taking a break from the squad for a bit until my fire for them reignites a bit. I'm very excited to finally finish them! The Ripper Tamer is my fave. 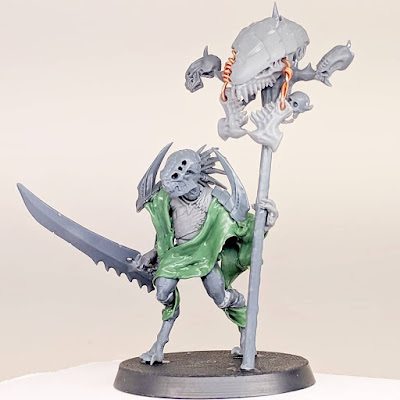 They're all really cool, but he feels like he's getting the most into the Tyranid mindset of using smaller symbiotic creatures as weapons. Plus, it makes me think of basically the same concept in other contexts, like, say, a Cawdor ganger who fights with hive rats strapped to his hands. 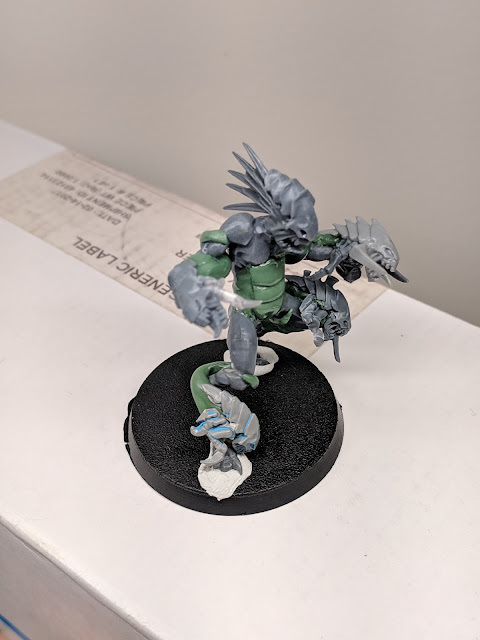 More like Kitbashuary at this point. Sorry, my mind just wouldn't let that one go. Def gonna have to keep that armature trick in mind for doing cloaks. 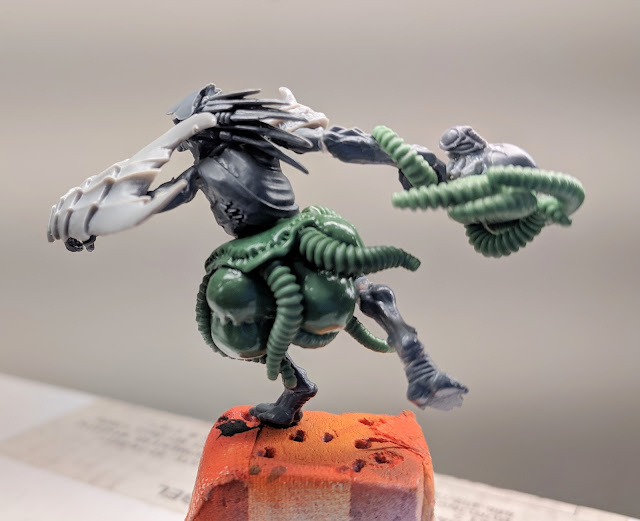 Thanks for the WiP shots there! 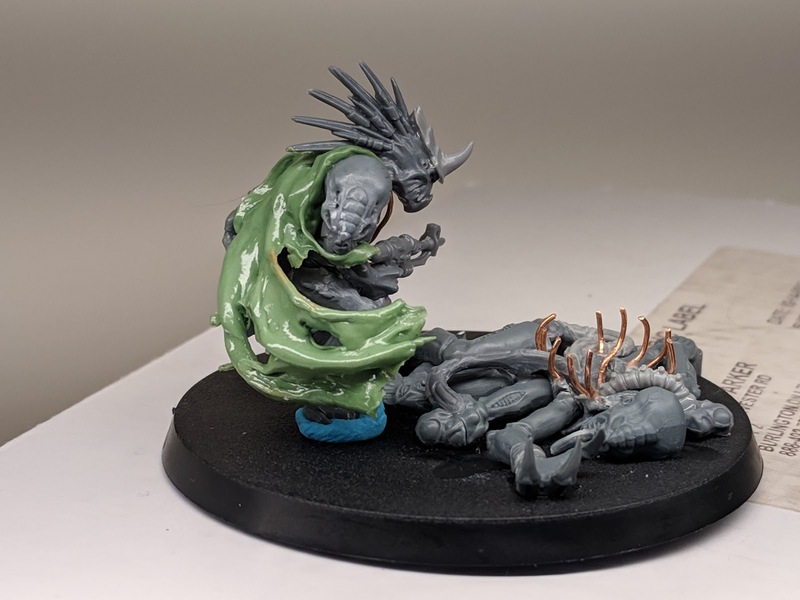 I'm also going to have to think more about using Bloodletter parts for Kroot. 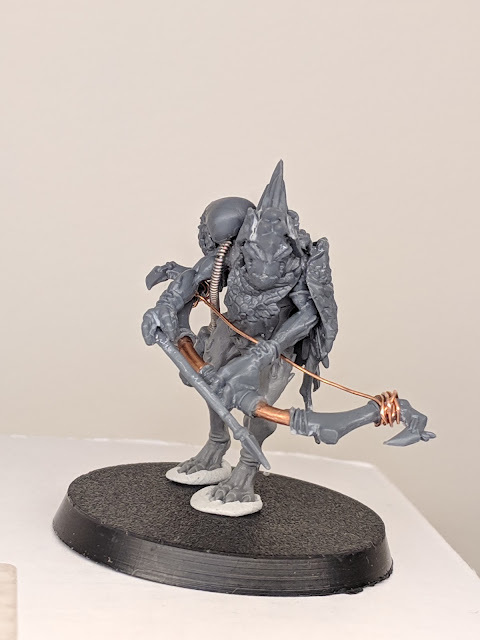 I don't really like the current Bloodletter Models, but I'm going to end up with some from Wrath & Rapture, and that could give me something interesting to do with them. Thanks sir! And please take any and all of my ideas and use them to your heart's content. I've learned a lot of tricks from others over the years, so I owe it to the community to inspire some of my own! 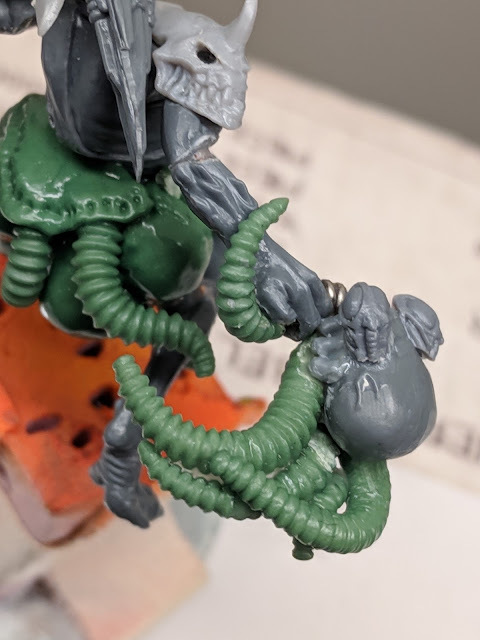 In fact, I got the idea to use the bloodletter models from someone else on Instagram who was using them as Genestealer mutants. You might not like them in their bloodletter configuration, but I assure you that, when you strip off the pimples/bumps, they have some of the most interesting musculature in the citadel line (them and the kaoric acolytes). I've used Bloodletter upper torsoes and arms for Wracks, and as you can see they work really well as Kroot. 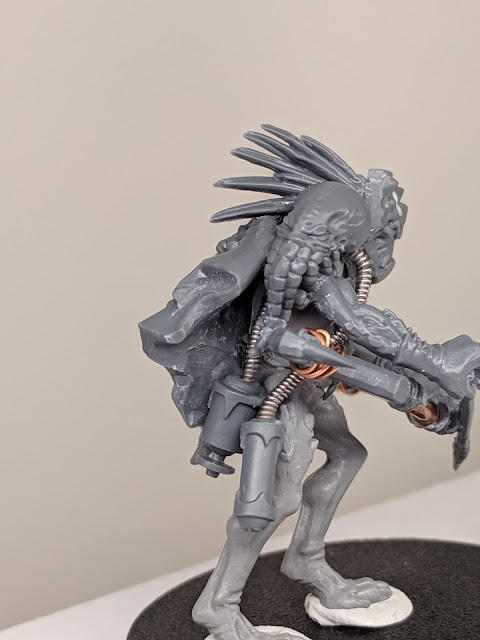 I've also used their heads for Tyranid gun barrels, as you can see on my gunner/heavy model. So, yes, maybe don't use them as bloodletters, but also don't throw them out! Absolutely spectacular! 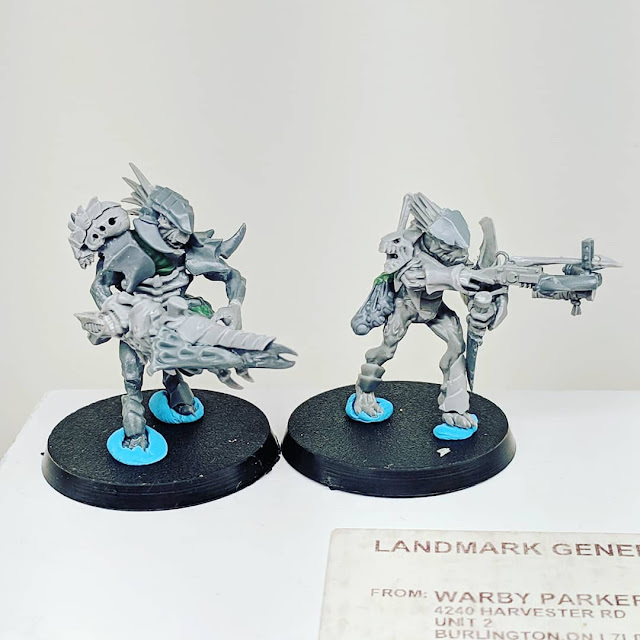 Each one tells a little story - Can't wait to see 'em painted up! 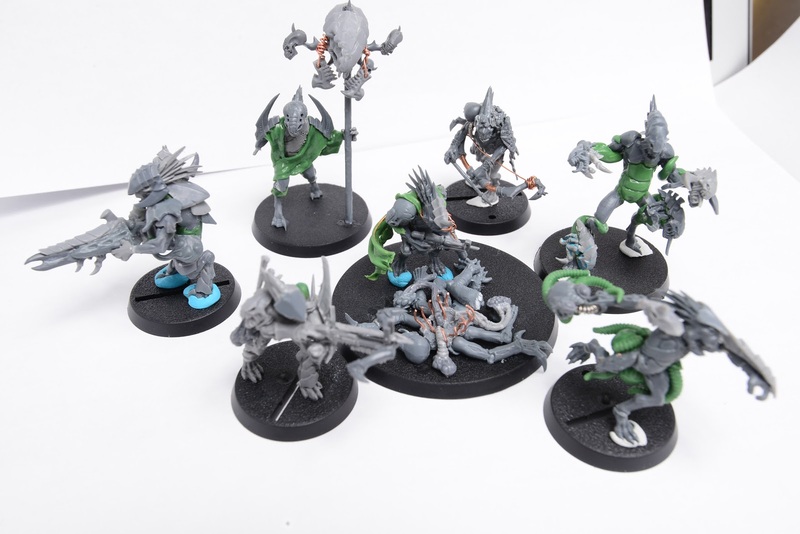 Though I hate painting, this is one squad that I myself really want to see painted up as well!